FMCG spend in emerging markets has slowed from 8.8% to 7.5%– equivalent $8.3 billion of lost growth. 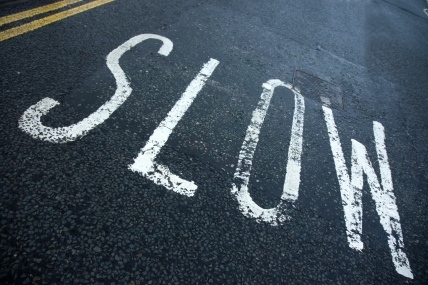 New research released today by Kantar Worldpanel reveals that growth in consumer FMCG* spend in emerging markets has slowed significantly from 8.8% in the 12 months to June 2013, to 7.5% in the corresponding time period ending June 2014 – equivalent to $8.3 billion of lost growth – demonstrating the effect of a cooling in the global economy. The research also forecasts a further reduction by June 2015 to 7.0%. The drop is largely driven by a slowdown of consumption in Asia where FMCG growth is now at 5.2%, down 3.6 percentage points compared with last year – some $15 billion. The contraction was felt acutely in China where FMCG growth has fallen by a third in the past two years from 15.8%, in the 12 months ending June 2012, to 5.6% in the period ending June 2014. Latin America is now growing at 13.0%, versus 8.7% last year. While in some countries, including Ecuador and Colombia, this is driven by underlying growth in demand, in others it is the result of rising inflation. Although still performing strongly compared with mature markets in Europe and North America, the reduction in emerging market growth is significant. 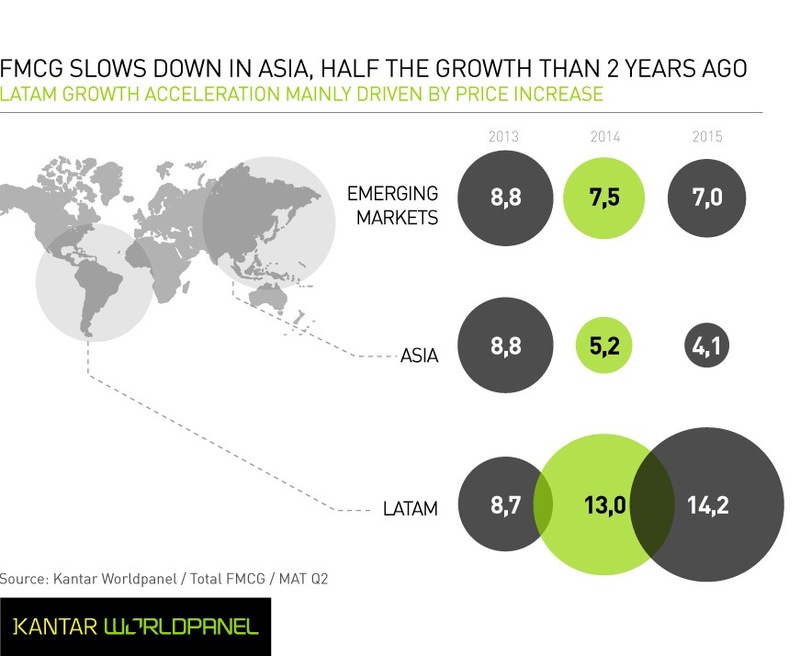 Jason Yu, General Manager at Kantar Worldpanel China, explains: “Slowing economic growth across many emerging economies has led to shoppers reining in their spending on everyday goods. We now face a new reality where FMCG growth is more moderate. Competition will become fiercer as the size of the prize shrinks. Brands will need to be even smarter when deciding which markets to target and when developing their approach within each country. Latin America’s FMCG growth has accelerated to 13.0% in the 12 months up to June this year, and is forecast to end 2014 at 14.2%. The region’s growth has been driven mainly by Brazil, which accounts for 42% of FMCG consumption. In the past decade, lower and middle income households in Brazil have been able to afford goods that were previously out of their reach. More recently, however, rising inflation has led to consumers becoming savvier and looking for ways to make the most of their household expenditure. 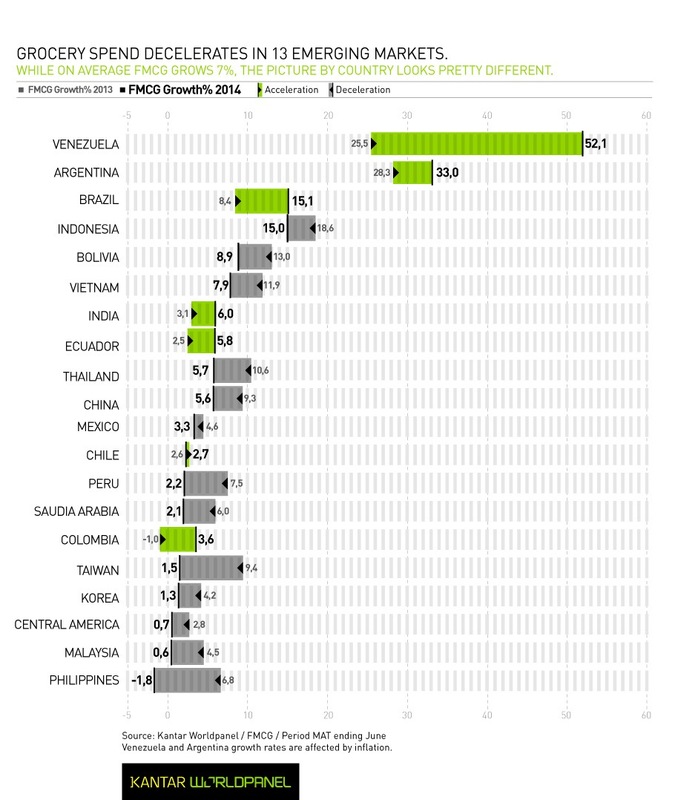 Inflation has a strong impact in the region’s growth – Latin America’s FMCG demand in volume has only grown 2.8% in the 12 months ending June 2014. Despite the slowdown in emerging market growth in general, there are still countries in which FMCG sales are performing strongly. Indonesia is one such example. Although growth in Indonesia remains high at 15.0%, it is down by 3.6 percentage points when compared to the 12 months ending June 2013. Consumer confidence in this 250 million population country is high, with GDP forecast by the International Monetary Fund (IMF) to grow by 5.8% next year. Brands that have launched new products in Indonesia this year have taken advantage of consumer appetites to try new goods. Shoppers in rural areas in particular now have more disposable income and are being attracted to spend on more consumer products. India has also accelerated its FMCG growth from 3.1% to 6.0% which is particularly important due to the size of this market. Ecommerce in emerging markets is an increasingly important channel and should be a prime target for brands. It is performing ahead of the market in Taiwan and China while South Korea is the world-leader in FMCG ecommerce with over half of all shoppers buying online. Chinese ecommerce is forecast to account for 3.3% of all FMCG sales by 2016 and this trend will continue as investment in technology and infrastructure spreads across the region. Certain categories within the consumer goods market are still posting strong growth. 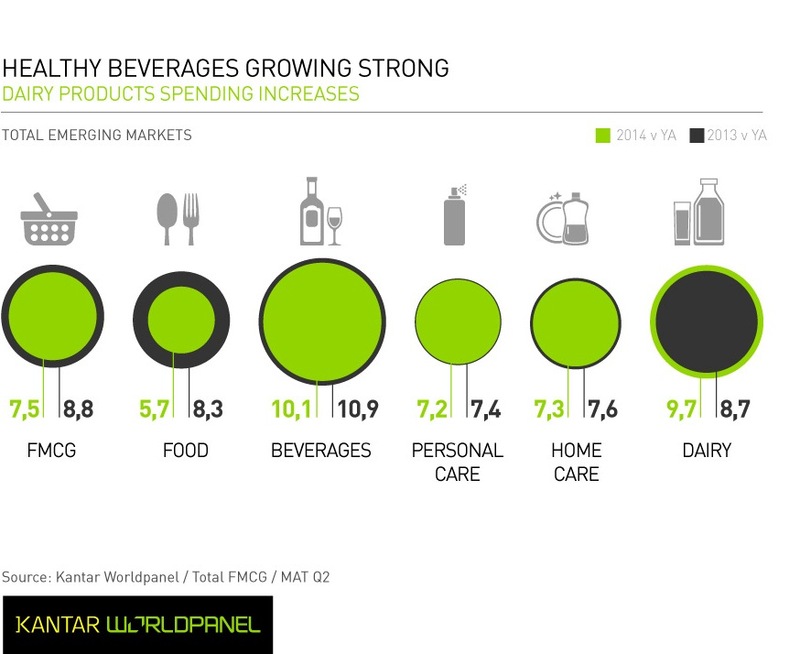 Beverages, for example, are growing the fastest of any product category – 10.0% in Asia and 8.0% in Latin America. Personal care products are also performing well in both Asia and Latin America as consumers with higher spending power start to buy into these non-discretionary categories. *FMCG – Fast Moving Consumer Goods: otherwise known as consumer packaged goods (CPG), these are products that are sold quickly and at relatively low cost. Examples include non-durable goods such as packaged food and drink, toiletries, and other consumables.